A dry season cattle camp with two byres (luak), huts, windbreaks and Evans-Pritchard's tent visible. As the dry season progressed in about January or February, larger cattle camps such as this with a greater population density would be formed called wec mai. 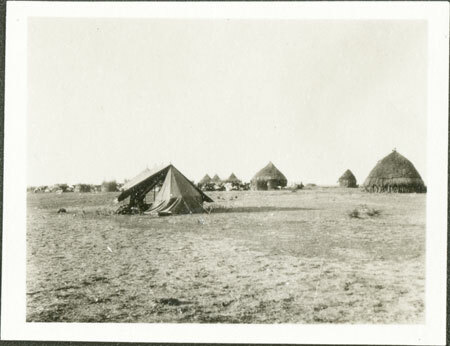 This image may well be of Yakwach camp on the Sobat river where Evans-Pritchard spent 3 months in 1931 among the Lou Nuer. The byre (luak) and huts visible in this image could be those of Cam-Carau, the chief man of the settlement, according to Evans-Pritchard's own sketchmap. Note on print reverse ms pencil - "2 170 "
Morton, Chris. "Nuer cattle camp " Southern Sudan Project (in development). 03 Jan. 2006. Pitt Rivers Museum. <http://southernsudan.prm.ox.ac.uk/details/1998.346.170.2/>.